Exploring the North-East section of Ginza is probably the better area in terms of shopping for high end goods, but for reasonably price goods, the South-West area is better. The South area is filled with reasonably priced bars and restaurants, but they may not always be friendly to foreigners. To experience the standing bar experience, many foreign people go to the 300 bar. It’s a nice place, but very smoky and a minimum 2 drink buy. I tend to avoid it, but when friends really want to go, I don’t always have a choice. This area also has a few karaoke bars to have a little fun. 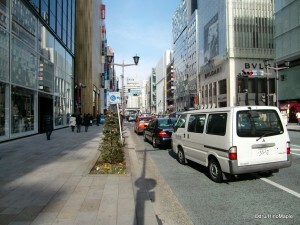 On Chuo-dori, you can head to Matsuzakaya which is a department store that caters to older women. You will also run into Zara and the first H&M store in Japan. You can also check out the “Lion” pub. They have two locations on this side of Chuo-dori. It’s a nice place that gives you a “European” feel, but to be honest, it isn’t worth it on a holiday, but if you want to go, it’s very popular for Japanese people. The West area continues to Ginza tradition of expensive shops. You will find many good, but expensive restaurants in this area. Along Chuo-dori, the most notable shop is Uniqlo. It’s a famous Japanese brand that promotes a simple, no brand style. The clothes are very cheap and generally of good quality. This shop also has a few Ginza exclusives to attract more people into the shop. There are also a few specialty shops selling traditional Japanese items. 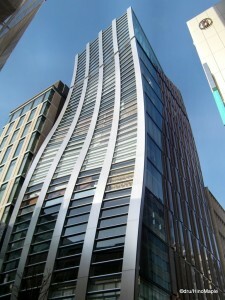 Along Harumi-dori, you will see Giorgio Armani and the Sony Building. 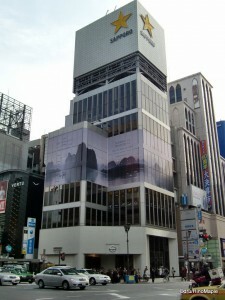 The Sony Building is very popular for tourists. You will be able to see the latest gadgets that Sony has to offer. They do sell most of the products and a few overseas models, but it’s just a fun place to play with all the cool toys. Sometimes they even offer special exhibitions for art. The basement has various goods within Plaza. Plaza is Sony’s own convenience store that sells many foreign goods. If you are also looking for cheap food in Ginza, going across the street to the Mosaic building, you’ll find reasonably price restaurants in the basement. While Ginza is a wonderful place to look and shop, due to the price of the products, it’s more of a tourist area and for people with money. If you continue south-west, you’ll reach Shinbashi, which has many cheap places to eat and drink. Going north, you’ll reach Yurakucho, which offers cheaper shopping and a few electronic shops. Due to the increase of tourists in the area, I am noticing less people heading to Ginza for shopping, but if you are out to see people, it’s a great way to see the stylish side of Tokyo. This is Part II of a 2 part series. Please head over to Part I to read the first half of Ginza. This entry was posted in Tokyo and tagged chuo-dori, Chuo-ku, chuodori, Ginza, Ginza Lion, Giorgio Armani, H&M, harumi-dori, harumidori, Mosaic, Nissan, Nissan Gallery, Nissan Gallery Showroom, pedestrian paradise, Plaza, Sapporo Beer, Shinbashi, Sony Building, Sony Plaza, Sonypla, standing bar, tokyo, Tokyo-to, Uniqlo, Yurakucho, Zara by Dru. Bookmark the permalink. o	As a long time wearer of all things Armani, I was shocked to find out that Giogrio broke his promise to stop using fur. I recently read about it on PETAAsiaPacific.com. Doesn’t he know what horrible lives those poor little animals are leading?! Being confined to cages and the brutally killed with barbaric methods! See what Armani is supporting by watching this video http://action.petaasiapacific.com/ea-campaign/clientcampaign.do?ea.client.id=110&ea.campaign.id=2556&ea.param.extras=ea_source_code:papadvarfifs~c=papfsaf.